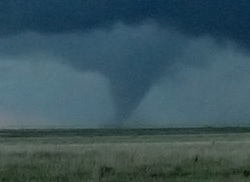 Since 1997, Storm Chasing Adventure tours has been embarking on the highest-quality storm chasing tours in North America. Storm Chasing Adventure Tours has been about technology from day one. We were the first to offer state-of-the-art lightning detection systems that can detect and track thunderstorms up to 300 miles away back in 1998. In 2000, Storm Chasing Adventure Tours was the first to offer The Weather Channel via satellite with the latest severe weather information from satellite imagery loops, NEXRAD weather radar loops, and weather maps in the chase vans as we drove to our daily storm chasing target location. We were also the first in 2003 to install the new on board, near real-time Storm Scan weather radar, displaying data via satellite every 6 minutes. While most of this equipment has been replaced by modern mobile broadband connections to the Internet, we've had a history of firsts in technology. We take storm chasing tours to a new level of excitement. 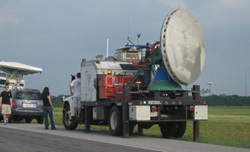 Occasionally, we might be chasing with scientists as they track down tornadoes in Tornado Alley with their Doppler On Wheels. You may have seen the DOW and Dr. Josh Wurman on many TV shows over the years. They were present during the May 3rd, 1999 F5 Tornado in Oklahoma City, Oklahoma. The DOW measured record high wind speeds of 301 +/- 20 m.p.h. in the Oklahoma City tornado. Whether you're looking for the thrill of the chase or the beauty of nature's fury, Storm Chasing Adventure Tours will give you one of the most exciting experiences in your life.